Today, US Secretary of State Rex Tillerson will meet his Indian counterpart Sushma Swaraj and PM Narendra Modi in New Delhi for talks over pressing regional issues. On the agenda will be deepening their strategic partnership in Afghanistan, the Indo-Pacific region and counterterrorism cooperation following Washington’s new South Asia Policy. 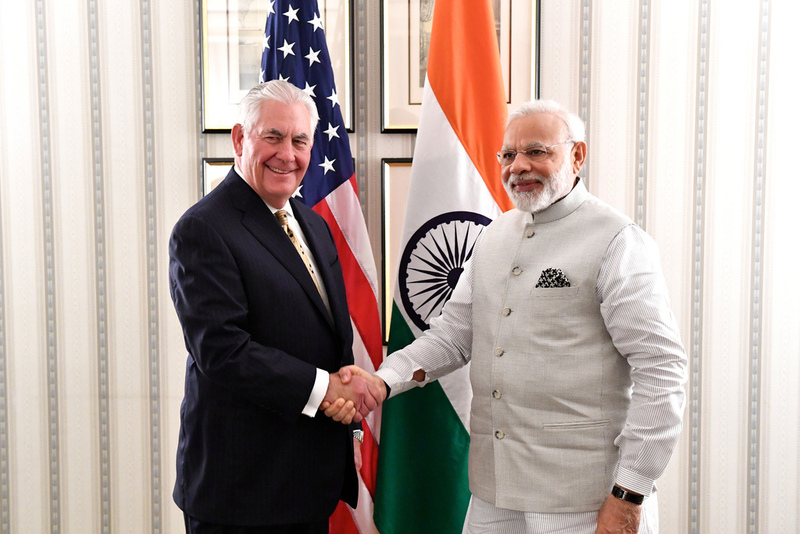 Coming amid the statesman’s five-nation tour of the region, Tillerson is expected to promote India’s role in improving Afghanistan’s socio-economic conditions, rebuilding infrastructure, and advancing Kabul’s institutional capacity. While it will not provide troops, India will contribute through information sharing and security personnel training programs. This will certainly attract the attention of its rival Pakistan, which has been the recipient of strong rhetoric recently when Tillerson said the US expects ‘decisive action’ against terrorism. Besides seeking New Delhi’s help in rebuilding Afghanistan, the US counts on India’s ability to counterbalance China’s growing regional influence via infrastructure initiatives.